We don’t have an age limit. We offer fun for all ages! For the protection of little ones, we have special small kids/parents area. Is there a weight limit for the trampolines? Wear comfortable clothes such as shorts, sweats, and t-shirts. No sharp objects such as belt buckles or clothing studs. You may not wear shoes on the trampolines. Altitude safety socks only. No jewelry is permitted on the trampolines. Refer to our park rules for more details. We do offer chips, drinks, muffins, candy, and other snacks. We also offer pizza as a part of our party package. No, you do not need to purchase in advance. Yes, everyone who jumps on our trampolines must first sign our waiver. Those under 18 must have the waiver signed by their parent or legal guardian. If I have signed a waiver before, do I have to bring it again next time? If you signed a paper waiver the first time, those only last for one day so you’ll have to sign an electronic waiver either online or at one of the waiver stations in the park which last for a year. What can I do at Altitude Trampoline park? Along with open jump, we have dodgeball, slam dunk basketball, a giant air bag, junior dodgeball, a battle beam, performance trampoline, rope swing, tumble tracks and an area special for small kids. We also offer multiple fitness classes throughout the week. Please check Pricing page. We also offer Special Weekday Deals. How come the lines are so long? We love Marysville and turns out Marysville loves us back! Sorry about the wait… we think you’ll find it’s worth it! How many people can use the park at the same time? Several hundred can enjoy the park at the same time. Why do we have to buy socks? Can we re-use them? Altitude safety socks have rubber grips on the bottom to prevent slipping. Absolutely! They are yours to keep! Wash them and bring them back! Yes! We offer multiple fitness classes at different times every week. Check out our schedule and info on the classes here. I don’t want to bring my phone or my watch. How can I know how much time is left? Do you accept birthday parties? Absolutely! Please call or email us for questions or to book your spot! Do you do group bookings or team buildings? Yes! Please see the question above about prices or check out our website here. For group bookings, can we have a separate area for jumping? Not for all group bookings but contact us to find out how you can book the whole park for just your group. We have cubbies for shoes, etc. We also have lockers, where you can pay $3.00 for 2 hours. We’re located in 6610 64th Street NE. Marysville, WA. Nope! We have fun for all ages and an area special for small kids. Can kids jump with other adults? What are your weekday and weekend Prices? refunds on jump passes, food/beverage, and merchandise, please contact us at 360-454-0099. All sales are final. No refunds can be granted for any tickets purchased. All purchases are non-refundable and non-transferable. Do you have a safety guide online that we can read? Yes. Click here for our park rules. I can’t seem to reach you by phone. What’s the best way to contact you? So sorry if we missed your call! 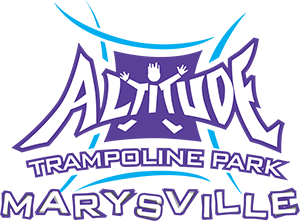 Please send us an email at info@altitudemarysville.com/ver2 or a Facebook message and we’ll be back to you in less than 24 hours!